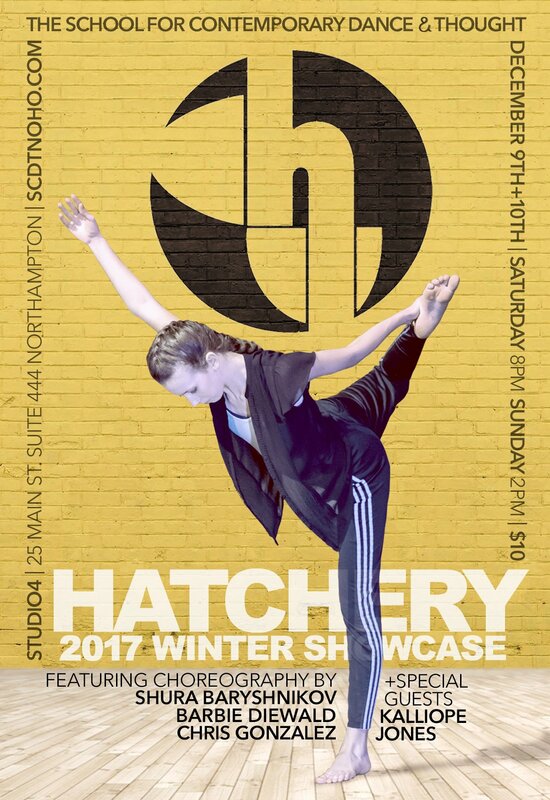 Now in it’s third season, Hatchery, the dynamic preprofessional dance company at The School For Contemporary Dance & Thought (SCDT), showcases exceptional young dancers ages 13-18. In the Winter Showcase, Hatchery will present the creative work of company members and professional choreographers Shura Baryshnikov, Christopher Gonzales, Barbie Diewald, and Hatchery directors Jen Polins and Jenny Bennett, in addition to a collaboration with teenage post-rock group Kalliope Jones! Hatchery, which performed at Jacob’s Pillow dance festival in June, is currently made up of 15 teens, ages 13-18, from diverse communities. The company offers rigorous training in contemporary techniques with an emphasis on developing the choreographic voice, geared to prepare young dancers from different backgrounds for the versatile demands of a professional career inside and outside the studio. In addition to studying with internationally acclaimed artists, members choreograph their own work, receive mentorship from experts in the field, and create dynamic inspiring performance for the Pioneer Valley. This week the company graces the cover of Valley Kids. [Interested teens can audition for Hatchery on January 7 from 1-3pm] supported by the Northampton Arts Council. Founded by Jennifer Polins in 2014, SCDT serves as a hub for the arts in Northampton by maintaining physical space for the local community and curating performance art of the highest quality on an international scale. SCDT’s mission is to offer movement practices that embrace multiplicity, arouse curiosity, and emphasize personal choice, and to cultivate an abiding respect for the tradition and history of reinvention. SHURA BARYSHNIKOV works as a dancer, actor, improvisor, movement designer, and somatic movement educator. She is co-founding Artistic Director of Doppelgänger Dance Collective, a Rhode Island-based project dedicated to the curation and commission of new works, and a founding member of the improvisation ensemble setGO. Shura is Head of Physical Theatre for the Brown University/Trinity Rep MFA Program for Actors and Directors, and has instructed at MIT, Dean College, Rhode Island College, Salve Regina University, Roger Williams University, and Connecticut College. BARBIE DIEWALD’s choreography is concerned with embodiment, ephemerality, and processes of becoming and unbecoming. Her work has been presented in New York City (BAM, Movement Research at Judson Church, 92nd Street Y, etc. ), Western MA (Jacob’s Pillow, A.P.E Gallery, SCDT), and abroad at pOnderosa (Germany) and the Bogliasco Foundation Center (Italy). Barbie directed New York City’s TrioDance Collective alongside Emily Jeffries, and worked administratively at New York Live Arts and Susan Marshall & Company. She is a Visiting Professor of Dance at Mount Holyoke and on faculty at the Pioneer Valley Ballet in Easthampton. CHRIS GONZALEZ is artist-in-reseidence ar SCDT and Artistic Director of Water Or Bread Theater in Northamp ton. He has worked with a youth education troupe at Northampton High School and just finished filming a full- length Devised Physical Theater piece called “The Restaurant.” Chris was a recipient of the James Baldwin Memorial Scholarship Fund for Playwriting from UMass Amherst, where he recently had the honor of playing Shakespeare’s Othello. As a featured poet he has performed with International Slam Champions Saul Williams and Shane Koyczan. Chris’s first book of poetry, the end or the beginning of water, will be published this fall by Human Error Press.